How do you export songs from iTunes into a folder on your computer outside of iTunes? Sometimes, you may want to copy selected songs from iTunes to a new folder on the computer but find that’ not easy especially for iPhone newbies. In this guide, we will show you two different methods on how to export music from iTunes to computer in a selected folder. Method 1: How to Export Music from iTunes to Computer Manually? Method 2: How to Export Music from iTunes to Computer Easily Using iMyFone TunesMate? To export music from iTunes to computer, the first method comes to people's mind is to transfer manually. Yes, without doubt, this manual method is effective in exporting music from iTunes to computer. Check out the step-by-step guide to export music from iTunes to computer. Step 1Locate iTunes music folder on your computer. Of course, the first step for moving music from iTunes to computer is to locate iTunes music on your computer. Mac: On Finder page, click Go > Home from the menu bar at the top of your computer screen, and then double click the Music folder to get access to iTunes folder. Windows: Click \Users\username\My Music\iTunes to find iTunes music. Step 2Drag and drop iTunes folder to desktop. Step 3Move the iTunes folder to computer. Same computer: Just move the folder on desktop to any folder you desire on the computer. New computer: Plug in an external drive to the computer, copy and paste the iTunes folder into the drive, and unplug the drive from the computer. And then you can drag the iTunes folder from your external drive to the Music folder (Mac) or My Music Folder (Windows) on your new computer after you connect the drive with your new computer. It is slow and time-consuming to export music from iTunes to computer in this manual way. For computer newbies, it might be difficult to locate the iTunes music folder. For them, an easy and one-click solution is preferred. Some purchased iTunes music is protected by Apple's Digital Right Management (DRM) technology. Moving iTunes music to computer won't make those music files work. Sometimes, you might run into iTunes errors, and iTunes limitations will prevent you from doing transferring task to some extent. Therefore, a more effective and faster way to export music from iTunes to computer is required by the public. Here, an iTunes alternative - iMyFone TunesMate will meet public expectation. iTunes can sometimes make things complicated with random bugs and other issues. But iMyFone TunesMate is different. Able to bypass iTunes limitations and iTunes error, it does a perfect job in syncing music from iTunes to iOS devices. Fast and convenient, exporting your music from iTunes to your computer hasn’t been this easy since the existence of iMyFone TunesMate. Easily bypass iTunes limitations(up to 5 devices limitation, one-way transfer limitation, purchased music limitation, etc.) as you export your music from iTunes to computer. Support various media files including music, playlists, podcasts, iTunes U, videos, photos, etc. Support not only free music but also purchased music for exporting music. Two-way transfer! 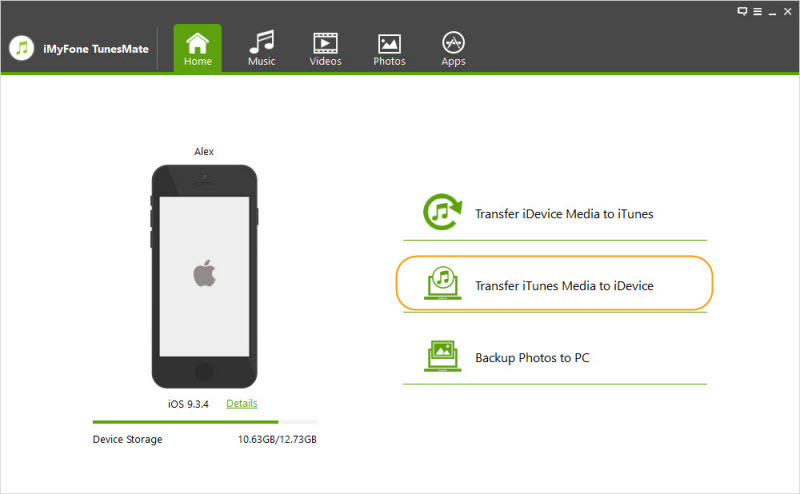 Not only can you sync songs and videos to iPhone, but also export iPhone media to PC/iTunes. One-click to fast export media files. 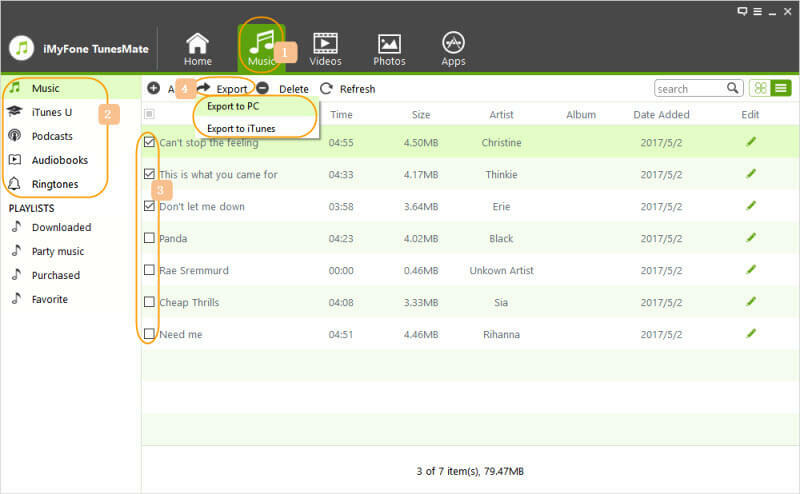 With iMyFone TunesMate, you can easily export music from iTunes to computer. Firstly, we export music from iTunes to iOS device; and secondly, we add those music from iOS device to computer. Take a look at how to export music from iTunes to computer. 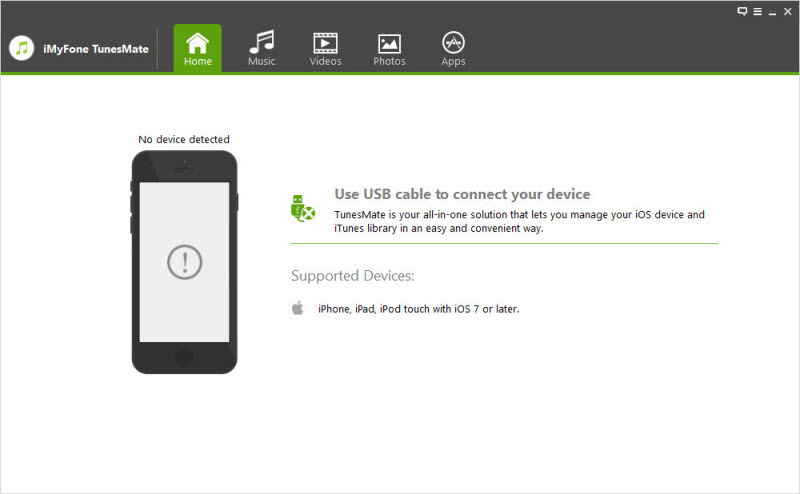 Step 1Launch iMyFone TunesMate software, and plug your iPhone/iPad/iPod to your computer using a USB cable. Step 2On Home interface, click "Transfer iTunes Media to iDevice", and then the program will scan all iTunes libraries to present them on a list. All media files will be checked by default. 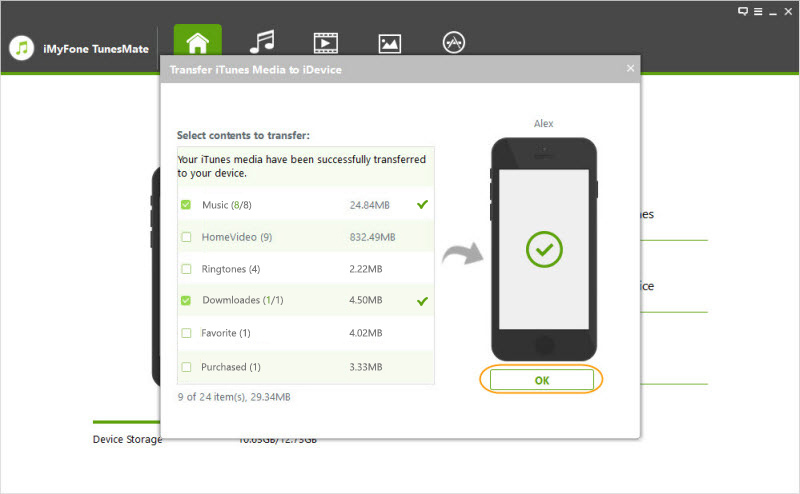 Step 3Choose and uncheck other media files except music files, and click "Transfer" to export iTunes music to iDevice. Step 4After exporting process completes, click "OK" button. Step 2Tap "Music" button at the top menu bar to enter music exporting interface where you need to choose Music from the left side panel, and then select and check music files you want to export to computer. And click "Export > Export to PC" to beginning the export process. 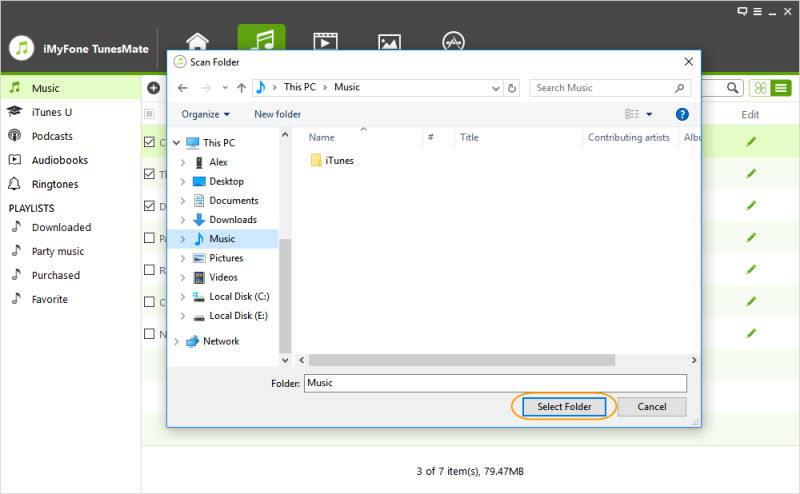 Step 3Browse and select a folder to contain music files exported. Step 4Click "OK" button after "Export Successfully" message pops up. Or you can click "Open Folder" to examine music files exported. Now you have grasped how to export music from iTunes to computer, and all your music files will be transferred successfully to your computer fast and conveniently. Enjoy!